I love fresh locally grown fruits and vegetables. To me, there’s nothing better than eating delicious home grown produce. I love growing my own produce in my garden, but I know that’s not an option for everyone. While I was in college and living in an apartment, I thought eating locally would be tricky, if not impossible because I couldn’t grown my own food. I craved the yummy, home grown produce I was used to having from my parents massive garden. That’s when I discovered farmer’s markets and I’m telling you I’ll never go back to eating produce from the grocery store! Buying fruits and vegetables from the farmer’s market supports local farmers, and it tastes AMAZING! I loved shopping at the farmer’s market in college (and I still do!) but sometimes shopping there can be a bit different from shopping at the grocery store. In the society we live in today, many of us are used to having whatever produce we want no matter the season. But it’s not that way at the farmer’s market. When you shop at the farmer’s market you have to eat foods that are in season locally because that’s all your local farmers are growing!! While it can be a bit of an adjustment to eat fruits and vegetables that are in season, trust me you will grow to love it! When you’re eating produce seasonally it tastes amazing and it’s fresh! Trust me, grocery store corn on the cob has NOTHING on fresh corn on the cob. One of my favorite parts about eating seasonally is getting to try out new fruits and vegetables. I love experimenting with new recipes and learning how to cook different types of produce! When I realized how many people don’t understand produce seasonality, I decided that I would write a monthly blog post to give a general idea of what produce is in season that month. 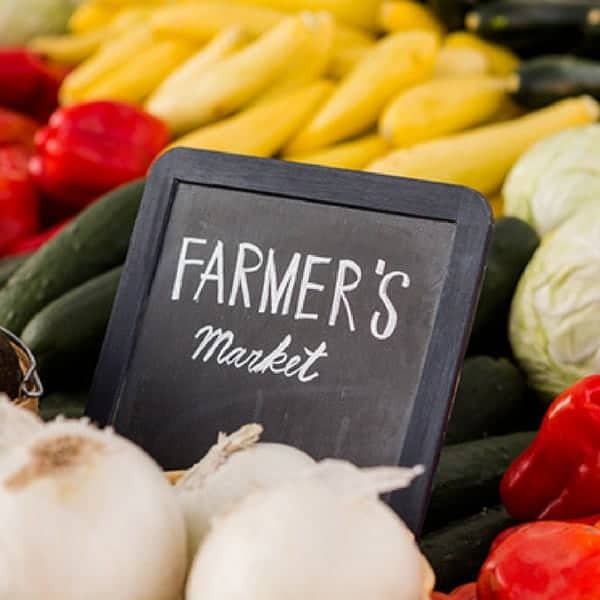 Now obviously this will vary depending on where you live, you Californians can probably get pretty much any produce you want, but if you’re living in Michigan your local produce options could be slim depending on the season. So keep in mind that this is a general guide. If you want to know exactly what produce is in season in your area check out one of my favorite websites called The Seasonal Food Guide. 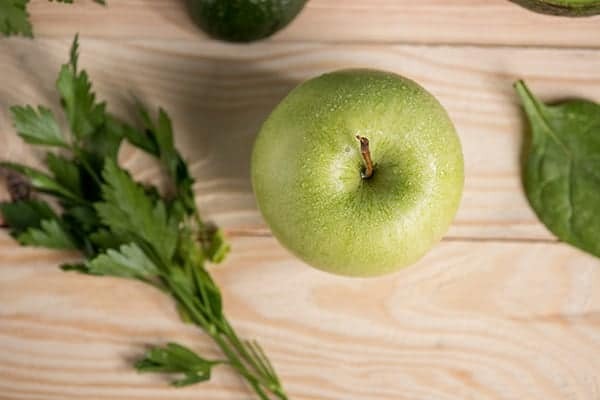 All you have to do is put in where you live and it will give you a list of produce that’s in season in your area! So let’s get started. Here are some of the fruits and vegetables you might find at your local farmer’s market in August! 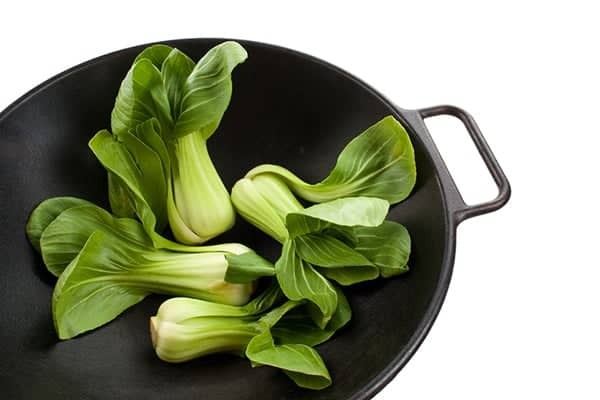 So I’ve never actually had bok choy, but I am definitely heading out to my local farmer’s market this month to pick some up! One of my favorite things about the farmers market is getting to try new fruits and vegetables that are in season, so this year I’m going to have to try bok choy out! I love stir fry so when I pick some up I’ll have to try this stir-fried chicken and bok choy recipe! As a kid I HATED cantaloupe, but now it’s actually growing on me! I love eating it raw, but this year I will definitely have to try out this strawberry cantaloupe smoothie! Oh chili peppers. One of the best things about August is that peppers and tomatoes are season, so I can make salsa! Check out my favorite salsa recipes here! And speaking of salsa, here’s another salsa essential that’s in season in August. Not only is cilantro great for salsa, but it also makes some awesome salad dressing. Check out this recipe for my absolute favorite creamy tomatillo salad dressing. 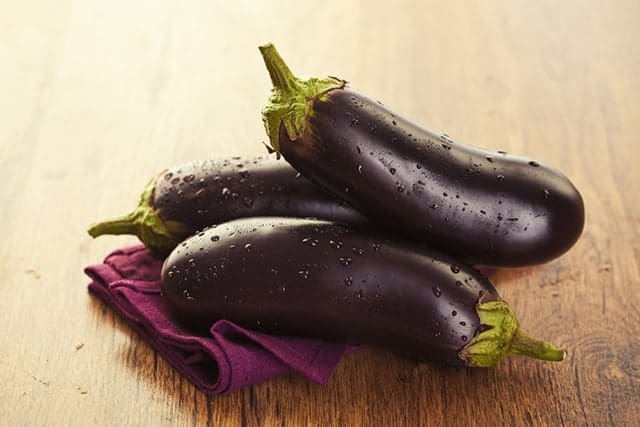 Eggplant was on my list for last month, but I put it on the list for this month as well so that I would remember to pick some up! I’m dying to try some of this eggplant parmesan this month! Grapes are in season in August! I am a huge fan of grapes because they are such a great healthy snack! One of my favorite things about farmer’s markets is they introduce me to new produce. I had never heard of okra until I was 19 and saw some at a local farmers market! It’s hard to find in my area because it isn’t well known, but I hear it’s a staple in the southern states. If I can find some I’m going to try this fried okra recipe! This herb is so good for your chickens and so I love that fresh oregano is in season this month. Check out my recipe for tummy treats for your chickens that includes oregano! I also sell dried oregano here. I look forward to peach season every years, so that I can have peach cobbler. I LOVE it! It tastes so good, and this is my favorite recipe here. I love peas! Typically peas are in season in early summer, but there’s a farmer near me who occasionally does a fall crop of peas and they’re done in late August to early September. I love that I can have peas in late summer too! I preserve my fresh peas every year, so that I can eat yummy peas all year long. Yum, peas! What are you harvesting right now? My favorite thing about July and August is that tomatoes are in season. Grocery store tomatoes have nothing on the locally grown tomatoes that I can pick up at the farmers market. And nothing compares to having a fresh tomato on your burger at a BBQ. This is another vegetable that I had never heard of before going to a farmers market. This stuff comes into season in my area in late August and early September, but in other areas of the United States it isn’t in season until October. I’m definitely going to try out this roasted kohlrabi recipe this August. What foods are you going to get at the farmer’s market this month? Let me know in the comments below!